Democrats' Hail Mary play to stymie the confirmation of Trump SCOTUS pick Brett Kavanaugh is beginning to fizzle out. As angry Dems demanded that a Monday hearing on the allegations against Kavanaugh be delayed until the FBI has a chance to investigate, turncoat Republicans (on whom the Dems had been depending for votes) instead withdrew their support and fell in line after Senate Judiciary Chairman Chuck Grassley declared that he would not honor Democrats' request. Grassley revealed his intention to stand firm late Tuesday after lawyers for Palo Alto University professor Christine Blasey, who is claiming that Kavanaugh attempted to sexually assault her 35 years ago when the two were 17-year-old high school students, said their client wouldn't be wiling to appear at Monday's hearing. According to the Hill, Grassley said Tuesday that there was "no reason" to delay the hearing now that Republicans have invited both Kavanaugh and Christine Blasey Ford, his accuser, to testify publicly. However, while Ford's attorneys have insisted that their client has taken a polygraph test and "deserves to be heard", Ford has bizarrely insisted that the FBI should have an opportunity to investigate her claims before she appears before the committee in order to spare her the "trauma" of confronting her alleged assailant. 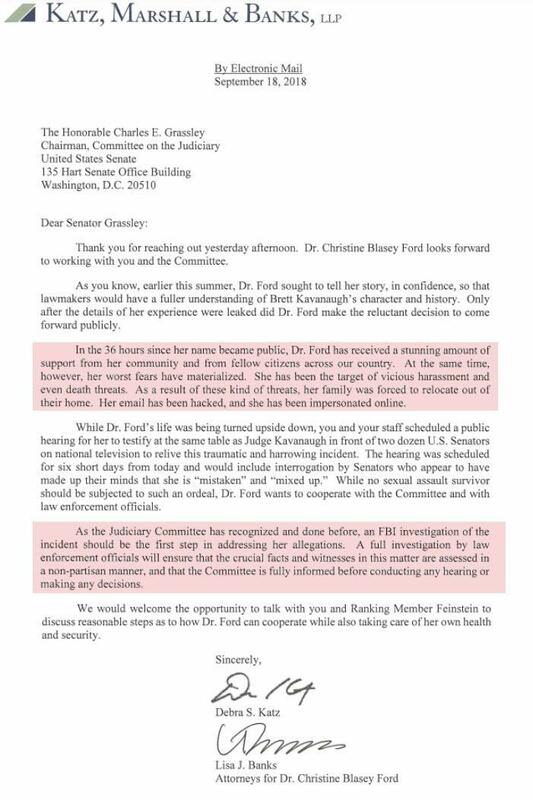 Ford's lawyers conveyed her request in the form of a letter sent to the committee, a copy of which was obtained by CNN. But Grassley said he would refuse this request as several Republicans who had appeared to be on the cusp of defecting after saying that the confirmation hearing, initially scheduled for Thursday, should be delayed said they wouldn't support further delays should Ford prove unwilling to testify. "Republicans extended a hand in good faith. If we don’t hear from both sides on Monday, let’s vote," said GOP Sen. Bob Corker (Tenn.), who was one of the first Republicans to call for the Judiciary Committee to hit pause on Kavanaugh's nomination on Sunday. GOP Sen. Susan Collins (Maine) told reporters earlier Tuesday that Ford's lack of response to the committee about testifying was "puzzling." And GOP Sen. Jeff Flake, who had threatened to vote against Kavanaugh if Ford wasn't given the chance to be heard, told CNN that he expected the committee to move on if she doesn't appear. "I think we'll have to move to the markup," he told CNN. "I hope she does (appear). I think she needs to be heard." Kavanaugh has denied Ford's allegations and insisted he didn't attend the party where the physical assault allegedly took place. Patrick Smyth, a fellow former Georgetown Prep student whom Ford alleges was also in attendance during the party issued a statement via his lawyer standing up for Kavanaugh. And in a separate letter to Grassley and Democratic Sen. Dianne Feinstein, not only does Smyth repudiate Ford's allegations, but he adds that he doesn't remember this party even taking place. "I have no knowledge of the party in question; nor do I have any knowledge of the allegations of improper conduct..."
Of course, Feinstein - who admitted last night that she couldn't say for certain that Ford's story is entirely truthful - sat on Ford's allegations for three months before referring them to the FBI and sharing them with other lawmakers (who purportedly "leaked" it to the press). President Trump on Tuesday said that he "feels sorry" for Kavanaugh, adding that he doesn't want to "play into [Democrats] hands", presumably by giving them more time to drag out the confirmation process. "They should have done this a long time ago, three months ago, not now. But they did it now. So I don't want to play into their hands," Trump said. Without the support of their Republican allies, Democrats will lack the votes on the committee to hold up the nomination past Monday. Though bizarrely, Kavanaugh himself hasn't said yet whether he would or wouldn't testify, which begs the question: If neither Kavanaugh nor Ford appear at the hearing, what exactly will lawmakers discuss?